The CARC tower and antennas are in need of some TLC. We are very lucky to have a couple of other Versatowers mounted on trailers. 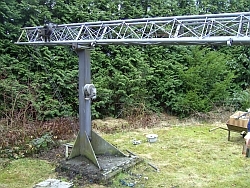 One of these is a 60ft heavy duty version which given that we have quite a few antennas on our tower and that it is un-guyed would be best installed at the hut. To that end we have agreed to swap our fixed tower with the heavy duty Versatower over the period of a couple of weeks. I’ve created three events in the club calendar but want to make sure that everyone possible is aware of the plans and of course to tout for volunteers to help with the work. The first day will be during the club meeting on Sunday 9th April when we will luff the current tower and strip the antennas for servicing. All of them need some work. THE FIRST HAS BEEN CHANGE TO SATURDAY 8TH APRIL TO AVOID A CLASH WITH ANOTHER CLUB EVENT. The second day will involve swapping the current fixed tower for trailer tower and base. This will happen on Thursday 13 April, just before the Easter weekend. We need to do this on a weekday as the trailer tower is stored in a builders yard which is not open on a Saturday. A draft action plan is available on the notice board next to the tea bar in the hut. Please do your best to help especially on Thursday 13th when we will need several members to lift the tower sections about. These are quite manageable if there are enough people to share the load. We managed all the work on Thursday 13th and so won’t need to rig the tower on Sunday 23rd. We do however need to get the antennas back up on the new tower.